When determining which investments to make in their technology infrastructure, organizations will often choose to make no changes at all. While this decision avoids short-term costs and business disruption, it will simply delay the inevitable—even making it worse. The cost of doing nothing is just not worth it in the long term. 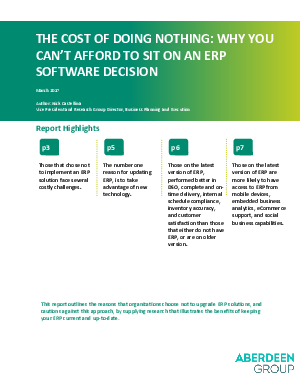 This report—from the independent researchers at Aberdeen Group—outlines the reasons organizations choose not to upgrade enterprise resource planning (ERP) software and cautions against this approach, supplying detailed research that illustrates the benefits of keeping your systems current. With the ability to utilize new best practices and other innovations, employees at these companies get the information they need to make informed decisions and act more efficiently, improving overall company performance. Epicor has a long history of providing ERP solutions tailored specifically for the manufacturing industry. Check out the report, and see how upgrading to Epicor ERP can help grow your business.